In the past I was able to try out the facial mask for Glam Essentials so I am glad to be able to try out another of their products. I wish this had a pump top but the click top is works pretty well in the shower as well. I use this with some of the other products I have that don't fit into a skin care line. I would rather use all of the same skin care items on my face but not every company has that available. This is a light cream like cleanser which is easy to use, the scent is not overwhelming, is easy to rinse and feels wonderful after. Hello Cutie Facial Cleanser can be found on Amazon. What Glam Essentials has to say about their product. 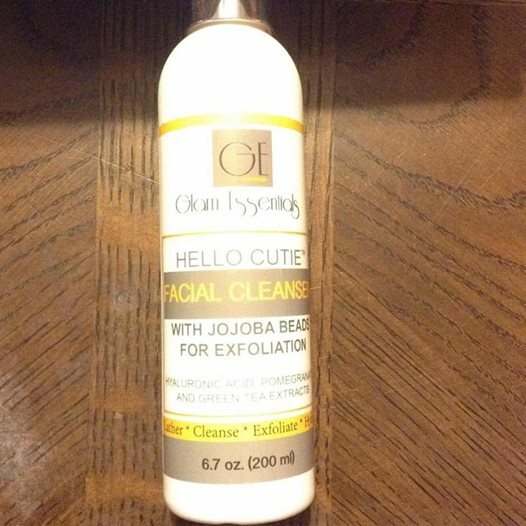 GLAM ESSENTIAL HELLO CUTIE FACIAL CLEANSER not only remove dirt and oil but the jojoba beads buffs the skin removing dead skin to prevent dullness and softens the skin.This cleanser results in cleaner, softer, and brighter skin that gives you a radiant glow.THE HELLO CUTIE FACIAL CLEANSER is not just a cute name. It's a FACIAL in a bottle. We push the limits in what we could use in this product. Let's start with Pomegranate. Such a delicious little fruit can do BIG things for your skin. It's amazingly good at adding hydration, as well as being jam packed with antioxidants which gives it the power to help with cellular regeneration. Fresh skin does equal a fresh you, after all, and the aromatics of this mask are minty and refreshing. Peppermint, Eucalyptus, and Green Tea all penetrate deeply into skin. Blackheads, pimples, and toxins don't stand a chance! All of these wonderful botanicals are enhanced by the almighty healing power of Aloe Vera. Disclosure: MarksvilleandMe received one or more of the products mentioned above as part of a promotion with Tomoson and Glam Essentials . Regardless, MarksvilleandMe only recommends products or services we use personally and believe will be good for our readers. Some of the links in the article may be “affiliate links.” This means if you click on the link and purchase the item, I will receive compensation. If you would like MarksvilleandMe to review a product or service please contact us at marksvilleandme@gmail.com.